Should I Buy A Put Or Sell A Call? One of the most confusing things that stock traders are likely to encounter in the options market is that options offer more than one right answer. There are usually several different ways of earning a profit with options, whereas there is only one way to earn a profit on a stock – trade the stock at the right time. That’s the case with two option strategies that are popular during Bear markets: buying Puts and selling Calls. Which is better? The answer is relatively simple. Experienced option traders may wish to skip right to “The Answer” below. For everyone else, here is a little background that explains why that answer is so important. In a bearish trading environment, where the overall trend for stock prices is in a downward direction, there are many ways to structure options in order to profit from the down-trend. Perhaps most easily understood is the purchase of a Put option. Put options tend to increase in value as stock prices fall. The reason for the increase is quite simple; a standard Put option gives the owner of that option the right to sell 100 shares of stock at a pre-determined price. For example, the right to sell 100 shares of stock, at $50 per share, can become quite valuable if the stock price suddenly falls to $40. 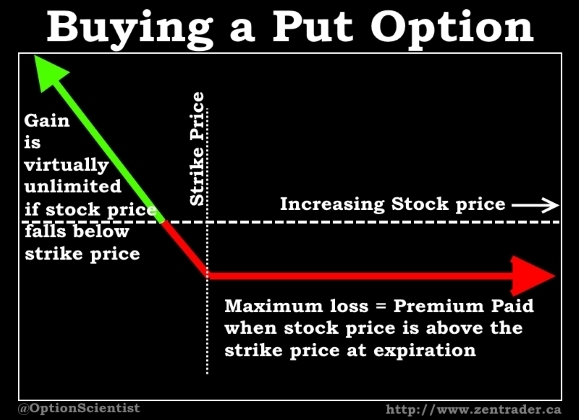 The pre-determined price remains constant throughout the life of the Put option, and is known as the strike price. A standard Put option with, for example, a $50 strike price gives the owner of that option the right, but not the obligation, to sell 100 shares of stock for $50 per share. The beauty of the Put option is that the owner of the option is guaranteed a $50 sale price (the strike price of the Put option) if the stock price declines below $50, but is not obligated to sell the stock at $50 per share, for example if the share price climbed to $60. Buy Now – There’s absolutely No Obligation! The absence of an obligation is what makes options so powerful for their owners. The owner of an option contract is free to crumple it up and throw it in the trash at any time, provided the contract was printed on paper, though most option trading is done electronically these days. Even in an electronic option contract there is never an obligation on behalf of the owner. The reason the absence of an obligation becomes so powerful for option owners is that there is never an obligation to pay out anything more than the initial cost of the contract itself, but there is always a chance to earn a profit on the option. So, when a trader buys a Put option, there is no obligation to do anything at all if the stock price rises, but there is a potential to earn a profit, often a substantial profit, if the stock price falls. As an example, a trader might buy a Put option on XYZ stock with a strike price of $100 per share. A month from now, if XYZ was trading at $110, the trader could simply throw the option in the trash. However, if XYZ had declined to $80, the trader could buy 100 shares of stock at $80 and then immediately sell those same shares at $100 each, which is the strike price of the Put option. That’s a $20 gain on each share! Buying a Put option can result in a profit when the stock price declines. Put options can seem like the Holy Grail when stock prices are in a down-trend. But, there’s a problem with them. The problem with Put options might not be immediately apparent, but it is nonetheless quite simple. Buying a Put option, or any option for that matter, requires capital. Every option has a cost. If a trader ends up throwing the option in the trash, the cost of that option goes in the trash with it – it’s like throwing away money. The cost to buy the Put option also remains when a trader earns a profit. So, in the example above, the trader who earned $20 per share on 100 shares would have a gain of $2000. But the trader may have spent $5 per share on the Put option. The result is that the trader earned a $1500 net profit on the stock when the cost of the Put option is included. Simply stated – buying a Put option costs money, it reduces trading capital, it’s an expense. For that reason, buying a Put option is not always the best choice when stock prices are falling. In fact, it is quite possible to experience a net loss on a Put option trade, even when the stock price falls, if the cost of the option exceeds the gain on the stock. There are other alternatives for traders looking to use options to earn profits when stock prices tumble. 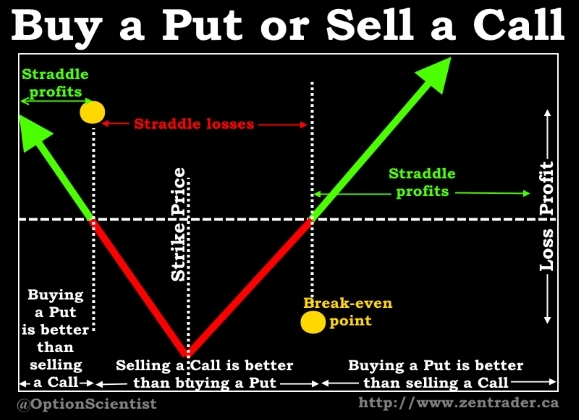 Instead of buying a Put option, a trader can sell a Call option. In the options world, selling a Call option is known as a Naked Call option. 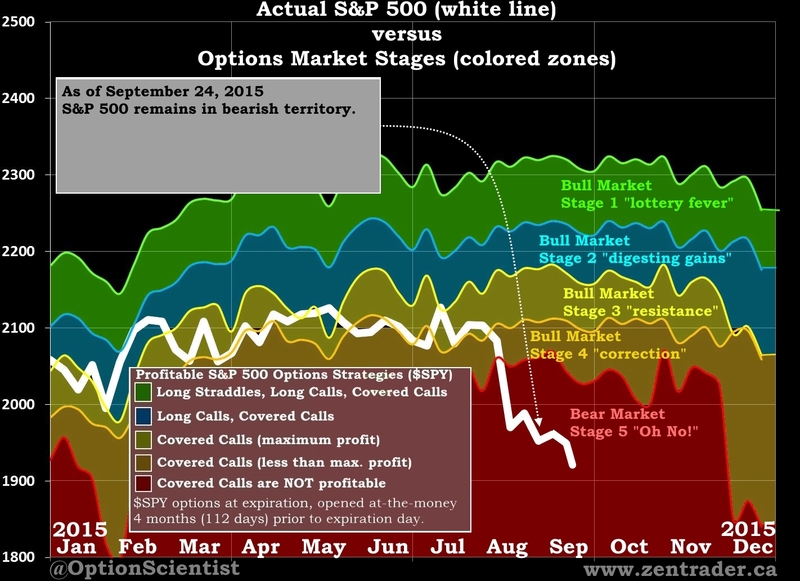 Call options tend to decrease in price when stock prices fall. So, by selling a Call option, a trader can earn a profit when the price of that option declines. For example, a trader who sells a Call option at $10 per share would earn a profit if the stock price fell and the trader was able to then buy the Call option back for just $3. A standard Call option gives the owner of that option the right to buy 100 shares of stock at a pre-determined price – the strike price. Call options can become very valuable, very quickly, when stock prices rise. But, when stock prices fall, many Call options eventually become worthless. Thus, the goal of selling Naked Call options is for those options to eventually become worthless. If a trader sells a Naked Call option for $10 per share and that option becomes worthless, the trader has earned $100 per share. 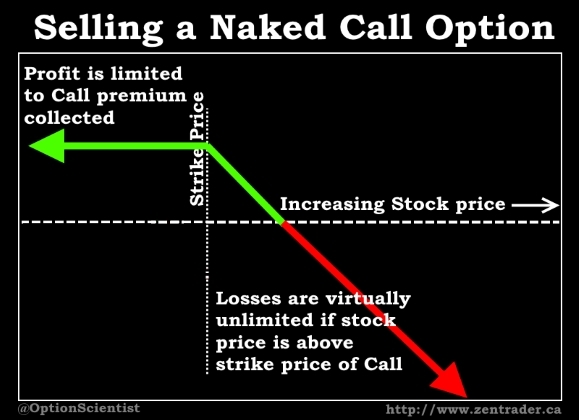 There is a risk in selling Naked Call options is not the same as buying Put options. The Naked Call option and the Put option each tend to profit from falling stock prices. But the risk of a Naked Call can be huge when stock prices rise. As noted above, Call options can become very valuable, very quickly if stock prices rise. If a trader sells a Naked Call option at $10 per share, that same option could be worth $20, $50, perhaps higher, if the stock price was to rise. To buy back the option at that much higher price would result in a large loss. The buyer of an option, any option, including a Call option, has no obligation. The buyer of an option is always free to throw that option in the trash. The seller of the option does not have that same luxury. The seller of an option is always obligated to fulfill the promises made in the contract. The seller of an option can’t just throw it in the trash if it doesn’t perform well. In the case of a Call option, the buyer of that option has the right to buy 100 shares of stock at the pre-set strike price until the option expires. The seller of that Call option therefore has the obligation to deliver 100 shares of stock to the buyer anytime the buyer demands it, and the buyer will pay the seller only the previously agreed-upon price per share for the stock – the strike price. So, for example, if a trader sells a Naked Call option with a strike price of $50 and the stock price later rises to $100, the buyer of the option can demand that the seller turn over 100 shares of stock and the buyer of the option will only pay the seller of the option $50 each for those shares. To obtain those shares the Call seller must pay $100 each, even though the Call seller will only receive $50 each from the Call buyer. The Call seller in that case would experience a $5,000 loss. Obviously, the scenario above is just an example. But it does illustrate the major difference in risk between buying a Put option and selling a Naked Call option. When stock prices rise, the buyer of the Put can only lose the initial premium paid for the option – nothing more. The seller of the Naked Call option can lose substantial amounts if stock prices rise – theoretically the losses on a Naked Call are unlimited. So, while buying a Put option and selling a Naked Call option are each appropriate choices for a bearish environment with falling stock prices, the risk of each is not the same. The Put tends to have much lower risk if stock prices make a large move upward. The potential loss when buying a Put is limited; the potential loss when selling a Naked Call is virtually unlimited. The potential reward from buying a Put option is also different than the potential reward of selling a Naked Call option. Each strategy tends to experience a gain when stock prices tumble. But the buyer of a Put option always gives up part of the gain to the expense of buying the Put option in the first place. The seller of the Naked Call option does not have any such expense. The seller of an option collects a premium upfront, at the time of sale. When stock prices make very large moves, owners of Put options can experience virtually unlimited gains. The only limit on gains comes from the fact that stock prices cannot go below zero. Otherwise, the owner of a Put option has unlimited profit potential when stock prices fall. On the other hand, the Naked Call seller only has access to a limited amount of profit. The best thing that can happen for a Naked Call seller if for the Call option to become worthless. Worthless is as low as it can go. Once the Call option declines to a value of zero, that’s as far as it can go. So, the maximum profit a Naked Call seller can earn is the amount of premium collected upfront, when the Call option was sold. Which is better: buying Puts or selling Calls? 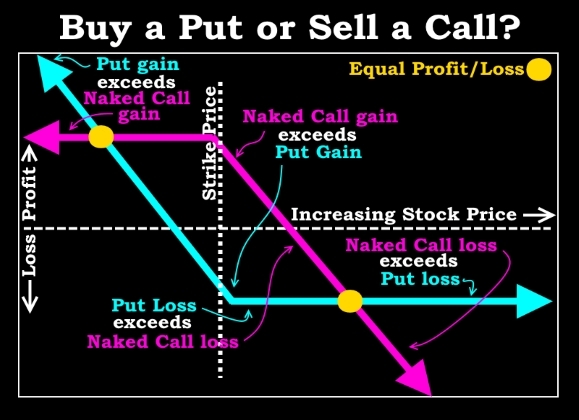 So, for example, if there are two traders, one a Put buyer and one a Naked Call seller, which will earn the highest gain? First of all, there are many different strike prices for options. So, to compare someone buying a Put option at one strike price and someone selling a Call option at another would be like comparing apples and oranges. The same is true of expiration dates for the options. There are some options that may expire next week, others that expire next month, and still others that don’t expire until next year To compare a Put option with one expiration date to a Call option at another would not be a fair comparison. What would be interesting to discover, is whether buying a Put option at a very specific strike price is better or worse than selling a Naked Call option at the very same strike price. So, it makes sense to use the most commonly traded strike price – the at-the-money or ATM strike price. The ATM strike price is basically just the same price the stock is trading at today. For example, if the stock is trading at $100, then $100 is the ATM strike price for an option. So, very simply, what we want to know is whether buying a Put option with an ATM strike price is better than selling a Call option at that same strike price. In other words, when is a Put the better choice? When is the difference between buying a Put and Selling a Call a positive result? If we use a plus sign (+) to represent buying and a minus sign (-) to represent selling, we can draw our question as a mathematical equation. To find the difference between any two things, we subtract one from the other. So we want to subtract (-) the sale of a Naked Call (-) from the purchase of a Put (+). Now, the equation on the left is the difference between buying a Put and selling a Call. It will yield a positive result whenever the equation on the right yields a positive result. The equation on the right is the same as buying a Put and buying a Call. Since we have already stated that all the options in the equations are at the same strike price – the ATM strike price – the equation on the right can be simplified even further. That final equation yields the answer for which we were searching. The difference between buying a Put and selling a Call will be a positive result whenever a Long Straddle yields a positive result, provided all options are at the same strike price and expiration date. That result is actually quite profound. Buying a Put option is only better than selling a Call option (at the same strike price and expiration) when a Long Straddle at that strike price and expiration is profitable. While the charts above are simplified to show the correlation between Straddle profitability and of Puts being a better trade than Naked Calls on expiration day, the truth is that the correlation holds true regardless of time to expiration. If a Straddle is profitable, then ,no matter how much time remains until option expiration, buying a Put at the same strike price and expiration as the Straddle will have experienced a greater gain than selling a Call at that same strike price and expiration. If a Straddle is not profitable, then the Naked Call will outperform the Put, again regardless of time to expiration. and again provided all options have the same strike price and expiration. A universal quality of Long Straddle option trades is that the line that separates profit from loss tends to occur in an area known as 0.8 standard deviations from the mean. Or, to round it off, essentially a Long Straddle is only profitable when the stock price has moved more than one standard deviation… not exactly, but somewhere in that area. So, Long Straddles only profit when the stock price moves further than the range of the market consensus. 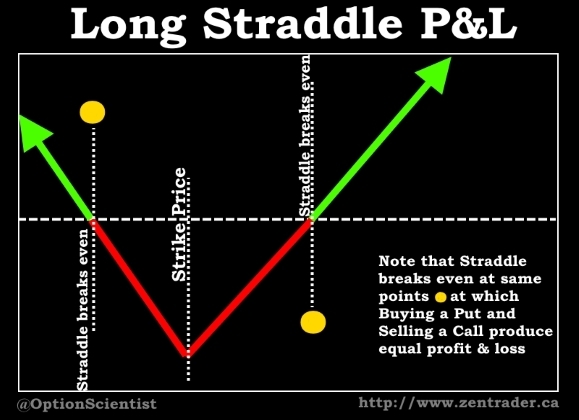 Long Straddles only profit when option traders, as a herd, are surprised. Thus, buying Puts is only better if one expects an upcoming move that is larger than the consensus – a move that surprises the herd – a move that is greater than approximately one standard deviation – an unexpectedly large move. Otherwise selling Calls is probably better. Since ATM options are the most widely traded, it is interesting to note that buying an ATM Put option is only more profitable than selling an ATM Call option when ATM Long Straddles are profitable. Given that last statement, the following charts may provide some insight. Each chart tracks a specific set of ATM options opened on $SPY. Although only 4-month expirations are used in this chart, it nonetheless provides a feel for the time periods when buying ATM $SPY Puts proved more profitable selling ATM $SPY Calls. Using the result of the equations above, the only time Puts are more profitable is when ATM $SPY Long Straddles are profitable. Since $SPY options are based in the S&P 500, the general environment tends to be similar for many individual stocks within the S&P 500. Thus whenever Long Straddles are profitable on the chart above, buying ATM Puts is likely to be a better strategy than selling ATM Naked Calls. Conversely, selling Naked Calls is likely to be the better strategy whenever Long Straddles are not profitable on the charts. A full description of these charts is available in the Thursday Evening Options Brief. To sum it all up, 4-month ATM $SPY Straddles are only profitable during a rally in the green zone or above (Bear Market Stage 1 Lottery Fever). So, the only time buying a Put will outperform selling a Naked Call during a rally is during Lottery Fever. That’s because the unlimited loss on the Call will outweigh the limited loss on the Put whenever Lottery Fever is underway. By the same token, 4-month ATM $SPY Straddles are only profitable during a sell-off in the violet or blue zones, generally reserved only for when Bear Market Stage 5 is at maturity during a fresh new Bear market, and again later during Bear Market Stage 8 when the downtrend is deeply entrenched. 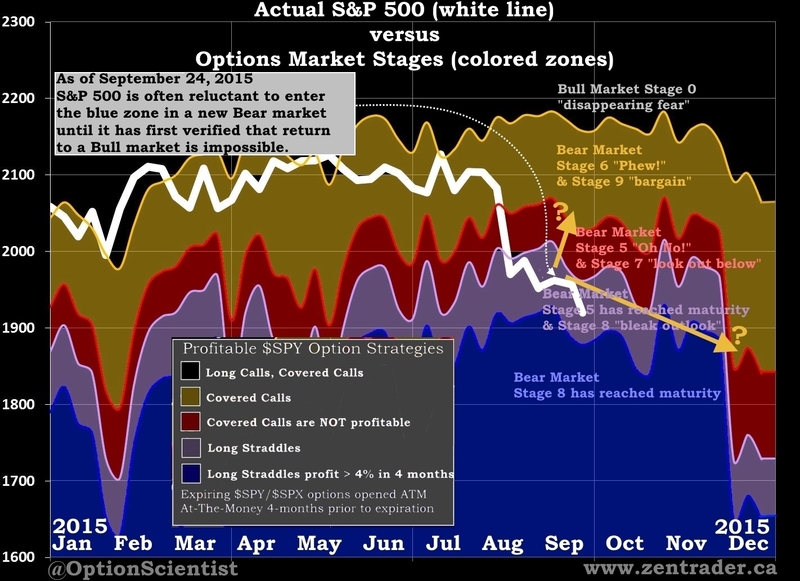 So, the virtually-unlimited potential gain from buying ATM Put options will outweigh the gain from selling ATM Naked Call options whenever Stage 8 is underway. It should be noted that in the violet and blue zones during a sell-off, buying ATM Puts and selling ATM Calls are each profitable strategies, it’s just that the Put profit is greater. Therefore, it can be argued that selling an $SPY ATM Call is the preferable strategy during a Bear market, because the only way the Naked Call will return a greater loss than buying $SPY ATM Put is if the S&P 500 is somehow infected with a bullish case of Lottery Fever. Despite the fact that, during a deep sell-off, gains on the Naked Call could be lower than gains from buying a Put, they are nonetheless still gains. The trader looking to decide between buying a Put and selling a Naked Call simply needs to ask whether a Straddle is likely to profit before the options expire. 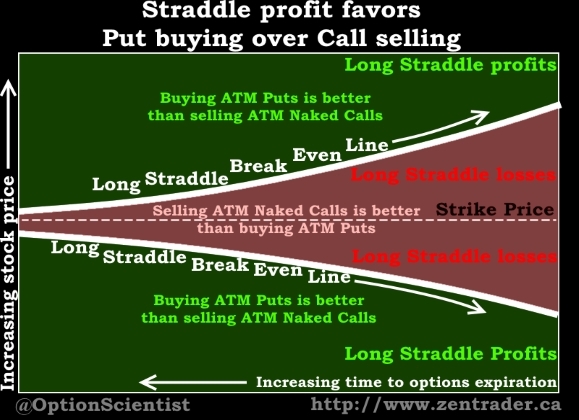 If no Straddle profit is expected, selling the Naked Call is likely the better choice. If a Straddle profit is indeed expected, buying the Put is likely the better choice.